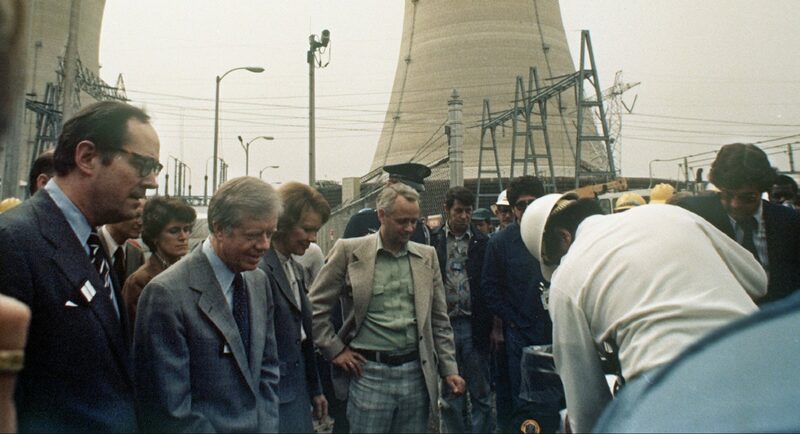 FILE PHOTO: Three Mile Island nuclear plant incident - President Jimmy Carter, second from left, visits the nuclear plant near Harrisburg, Pa., USA, April 4, 1979. This month marks the 40th anniversary of the partial meltdown at the Three Mile Island nuclear power plant. WITF is collaborating with PA Post and PennLive on a multimedia, month-long look at the accident, its impact and the future of TMI and the nuclear industry. That includes new documentary television and radio programs, long-form audio stories, photos, and digital videos. The work will include the voices of people affected as well as community events to engage with listeners, readers and viewers. The Three Mile Island accident on March 28, 1979 is still considered the worst at a U.S. nuclear plant in history. Due to a series of human and technical errors, the core of the Unit Two reactor at TMI partially melted down. Though debated and controversial, research over the past 40 years concluded only a small amount of radiation escaped into the atmosphere and didn’t result in any deaths or injuries. This documentary details what happened inside the containment building at TMI on March 28: the chaos, confusion, miscommunication and fear in the area surrounding the plant afterwards and the legacy of TMI after the accident. Who is Stephanie Borowicz, the Pa. state lawmaker accused of delivering a ‘weaponized prayer’?